If you couldn't tell, that was an overly sarcastic comment I made that was intended as a joke. I still respect Jangbricks, and I am still watching his videos. If you take literally everything people say completely seriously, then I'm sorry, but it is you who is a "sad person". TBH I should have just used your post as a bit of an example of people who take the whole hipster hatin on fads thing a bit too far or whatever, but hey I was feeling a bit eh. sarcasm usually means some form of humour, "loosing" faith in humanity isn't a very funny joke. Also saying people don't have braincells to actually check the article is a bit extreme. A simple mistake on most parts. They act like psychos about it, at least in my experience. The people who I've seen have been freaking out whenever they can't find their spinner or it breaks, by that I mean they will literally scream and have a mental breakdown. if they act like that, they probably aren't very mentally stable. Also not to start a fight or anything, but this aggression you bring upon us isn't exactly the most grown up thing either. Not saying that to start a fight, just pointing it out. would you have prefered a nice statement of "grow the heck up"? You seem a bit hypocritical. I think someone who is trying to tell other people how to joke around because they can't understand the jokes being told needs to "grow the heck up". You don't have to attack people for disagreeing with something, and if you cannot understand a joke, then it's not the fault of the person who told the joke. I know it is harder to detect sarcasm when you are reading something rather than getting it said to your face, but really? Saying that I will never respect someone again because of a trend that they are following sounds serious to you? The joke didn't seem like a joke due to the tone you were using before. As for the vomit thing, if you really vomit cause of that, then you really should get that checked out. Plus I don't think our comments on the spinners are going out of our way to hate on the thing. fair point, but if i never watched one of his videos again, would I necessarily respect him? Because I found your statement of "grow the heck up" seemed a little hypocritical. but if i never watched one of his videos again, would I necessarily respect him? again fair point, but I think you know what I meant. But as much as I have enjoyed this little argument, it's kind of off topic. 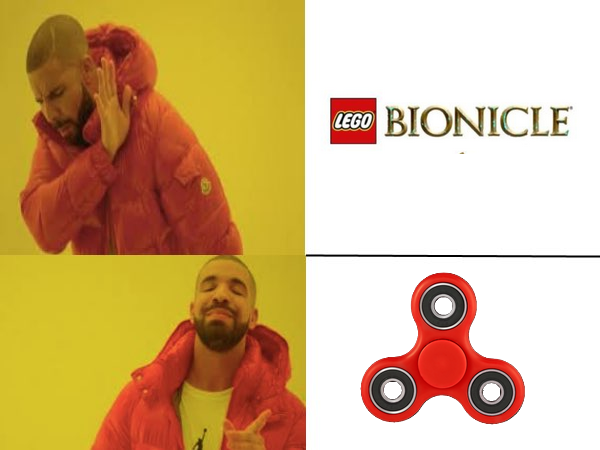 I suppose this post will be a little hypocritical as well, but what has pulling apart a joke I made relevant to a fidget spinner discussion? What is this adding to the discussion? Again this comment is a little hypocritical since I am part of this argument, but still, I think now we're just arguing for the sake of arguing while we wait for the Mod Squad to come and close this topic. Can we please stop being off topic, both of you? I wouldn't close the topic, I'd just punish the folks who broke the rules. That's...... Really sad, isn't a date important enough to take the extra time to manually check the profiles? So I have one of these things now. It's actually kinda cool, I can see why people like them, if you just have it in your hand it's fine for relieving stress. But I'm not saying it's the holy grail of fidget tools, I find C-4 explosives much better. I've never ever seen such things before, could someone fill me in on what they are? It's like a fidget toy thing but for some reason people like them a lot more than what could be considered healthy. Their a better fidget toy than those spinners and their just abnormally long strings. *They're. I definitely see your point. I don't see what's so amusing about these things. I played with one once for..... maybe ten minutes, and then I was bored of it. I think that the reason they have become so popular is because their simplicity and lack of well just about everything mainly a use thus applying to the largest audience. The only few people who I have met that don't support the craze have had high standards for what is interesting however nowadays people like so are lacking because it's much easier to find lots of low quality entertainment rather than waiting for say the next episode of your favourite tv show or whatever floats your boat in a sense it's a trend because it's simple and easy to understand and enjoy even if to a lesser extent .